I was born in a small town in northern Idaho. It rested in a valley surrounded on all sides by towering mountains. During the summer months, my friends and I spent a great deal of time upon the northern side of the town. We were taller than the summer before, and we had longer legs. So, each summer we climbed a little higher up on the mountain. It was my ambition to reach the top and see what was on the other side. 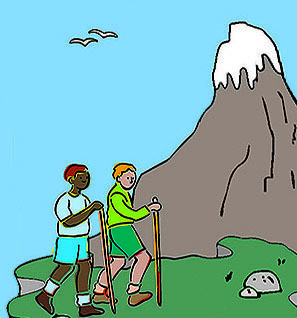 It was during the summer of 1930, when I was nine years old, another boy and I finally reached the top. At least we thought it was the top. As it turned out, it was not the top at all. The ground leveled off at that point for a few hundred meters to another mountain much higher. This second mountain was hidden from the view of people down in the town. We had never suspected that it was there. It was a shock for us to reach what I thought was the top of the mountain. As the years have passed, I have often recalled that occasion. In a way, that mountain has become for me a symbol of life. We are all seeking success in life. We set up certain objectives and work hard to accomplish them. Their accomplishment will mean success to us. Yet when we attain a particular objective, we find other tasks awaiting us. We have new desires to be fulfilled. The objective which we had set for ourselves appeared to be the top of the mountain. but when we got there, we found it was only a plateau, with yet another mountain to be climbed before us. Complete success can never be attained on this earth. The true top of the mountain is not here. We will reach it in the next world, when we rise to perfect union with God.